At Eternity’s Gate is a 2018 biographical drama film about the final years of painter Vincent van Gogh’s life. The film is directed by Julian Schnabel, from a screenplay by Schnabel, Louise Kugelberg and Jean-Claude Carrière. It stars Willem Dafoe as van Gogh, Rupert Friend, Oscar Isaac, Mads Mikkelsen, Mathieu Amalric, Emmanuelle Seigner and Niels Arestrup. It was selected to be screened in the main competition section of the 75th Venice International Film Festival, and was released in the United States on November 16, 2018, by CBS Films. 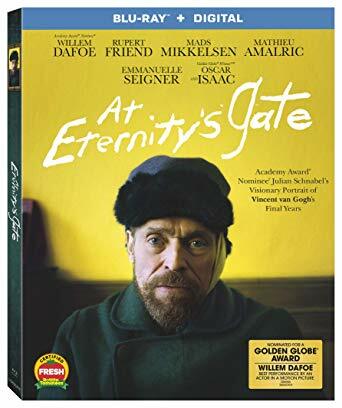 Purchase At Eternity’s Gate on Blu-ray Today! Based on the letters of Vincent Van Gough corroborated by confirmations of hearsay and invention we see the life of Vincent Van Gogh who later became an infamous and adored painter whom at his time dealt with illness, skepticism and ridicule. There’s a lot to this film and one must be willing to invest the time and concentration needed to follow it closely. Also a film that one might gain more from subsequent viewings. William Dafoe does a great job portraying Vincent, and Oscar Isaac does a stellar job as the co-star of this film. At Eternity’s Gate is one worth checking out! At Eternity’s Gate comes to blu-ray with strong crisp colors that have great contrast and lend well to the film. The paintings look great allowing the video transfer to capture even the textures in his painting style. Dark scenes work well, and vast outdoor country side scenes look splendid. Skin tones are captured quite amazingly once more proving that blu-ray disc is an impressive medium for film. At Eternity’s Gate comes to blu-ray with a 5.1 DTS HD Master Audio track that handles the film exceptionally. Strong dialogue processed exquisitely through a front heavy track. A nice subtle score that helps provide a great bit of ambiance to a film of this nature. Dafoe is one to have a very unique voice, and it was mastered superbly for this track. The following special features are included in this blu-ray edition.